Cozumel is Mexico's largest inhabited island, is also one of the country's biggest paradoxes. Serene, laid-back and somewhat undiscovered by Mexico's 20 million annual visitors, Cozumel rivals many Caribbean island destinations when it comes to visitor facilities, activities, and stunning beauty. Cozumel's appeal lies with its combination of the best of Mexico with the allure of vacationing on a Caribbean island. This mix makes Cozumel one of Mexico's most unique destinations, offering a hard-to-find vacation duality. The jewel shaped island lies just 19 kms. off of the Yucatan coast, and measures 29 miles ( 47 kilometers) long and 10 miles (15 kilometers) wide. Its jungle-clad interior and ivory white beaches are girdled by one of the most spectacular ensembles of coral reefs in this hemisphere. The island's limestone shore is surrounded by temperate, crystal clear waters which range from stunning turquoise to deep indigo. The climate on the island is warm year around with an average temperature of 81 F (27 C). Heavy rains start in June and go on through October. It is a possibility that rain can fall everyday, but the usual duration of a shower is brief. Expect high humidity during the rainy season. The humidity levels are lower November through May, with an occasional cool evening. However, because it a tropical climate, the weather can change from one day to the next. The westward side of the island is calm, and is ideal for swimming, diving or just relaxing in the sun. This part of the island is also the most developed with banks, markets, shops, restaurants and hotels. The eastern side of the island is more secluded, with very few people living there and little activity. There are some calm beaches with clear emerald green water. There are at least 20 live reefs so close to the shore, it makes snorkeling and diving a must. The island also has it's share of Mayan ruins hidden in the jungles that can be explored by car, bike or foot. The area's diving and snorkeling are legendary. 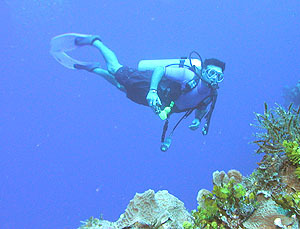 Following a 1961 documentary by Jacques Cousteau, Cozumel earned a world-wide following of divers who ranked it one of the top five scuba diving and snorkeling sites on the planet. The island's surrounding sea is teeming with undersea life, colorful reefs, and the slumbering hulls of Spanish galleons. For non-divers, the island has something for everyone. Sightseeing includes over 35 archaeological sites (only a few of which are accessible and worth seeing), and the charming village of San Miguel de Cozumel. The town is a collection of cafes, restaurants, and attractive boutiques. 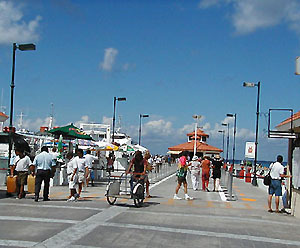 It encircles the main plaza, and extends several blocks along the city's breezy seaside promenade. Nature lovers come to Cozumel to see giant see turtles laying their eggs (May to September) and to observe the island's variety of exotic migratory bird life. Visitors are only a 40 minute ferry ride from the incredible Tulum Corridor region of the Yucatan Peninsula, brimming with hidden beaches, secluded resorts and archaeological treasures. 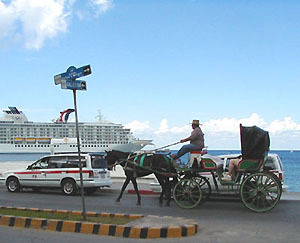 Large numbers of day trippers from Cancun and cruise ship passengers sometimes overtake the city proper, only to retreat a couple of hours later. This is when Cozumel really shines, as the island's bountiful man-made and natural attractions can be leisurely explored.